Hey guys, a rainy day here in England but it was much brighter in Paris as Roger comprehensively dismantled Somdev Devvarman 6-2 6-1 6-1 to book his place in the third round where he will meet Frenchman Julien Benneteau. As I said in my prediction post I expected Devvarman to play solidly and create some nice rallies and that's exactly what we got. I was a little susprised at how passively Devvarman played but none the less he is quite effective at keeping the ball in play and that meant Roger could really tee off on his groundstrokes which made it highly entertaining. Well like my last match analysis this won't be very thorough simply because there isn't much to go through. The best word to describe this match is: exhibition. I actually missed the first two games as I was en route home from work but as soon as I got in Roger had won the first 8 points of the match and was already cruising his way to the first set. For Devvarman to have any sort of say in this contest he had to get off to a good start so to lose his first service game to love was a disaster for him and just allowed Roger sit back, relax and let the forehand do the talking. Basically that was that and the single break was soon turned into a double break as Roger served out the set to love sealing it with a sick forehand. As for the second set the trend continued and Devvarman could do very little to prevent his serve been broken at will and even though he dug deep to hold in the first game he was soon down a break and this time Roger went one better serving up a breadstick to his Indian opponent who couldn't muster any real resistance. The third set saw Roger just completely play freely, going for every shot in the book with conviction, making a few errors and hitting some insane winners in the process, I thought it was going to be a bagel at one point with Roger cruising to a 5-0 lead in what felt like 30 seconds but Devvarman managed to string a service game together to avoid the embarrassment of not winning a game. That however was short lived as Roger fired down some more decent serves and then closed it out with a sweet inside out backhand up the line. 6-2 6-1 6-1. Routine. All round solid match stats. Overall I'm very happy with Roger's performance today, it was very easy but regardless he was definitely striking the ball cleanly. I know there will be some fans who will say “oh this is too easy” or “ah he hit some nice shots but made too many errors” but I have to disagree with those statements. I definitely like Roger to have testing matches but in the second round of a slam they are in no way essential, in these types of matches conserving energy and finding your form is what you want to happen and that is exactly what happened today. As for hitting wild shots, I don't really care about that, the key stat is always do Roger's winners outnumber his unforced errors, if the answer is yes, like today, then this is a successful match. When there's daylight between those two numbers it's very rare Roger is on the losing end of things. It's only when the errors out number the winners or they are constantly trading places you need to get worried. I was pretty happy to see him try and go ultra aggressive off both wings and see what he could do, yes he missed some shots but he made plenty too and in the later rounds there's going to be times when he can't just “play it safe” so figuring out what's possible and what isn't possible when he's 4-0 up and cruising is a very smart move. In terms of the match this was just a completely one sided affair, Devvarman is consistent and does play some nice points but he just has no power which means he cannot dicate a point in a million years. Even when he had Roger defending he never really looked capable of finishing things off and that was clearly reflected at how often his serve was broken, 7 times in 14 attempts. To put things in perspective I think Roger has won slams and not lost his serve that many times throughout the whole tournament. In terms of stats they're all good, 54 winners to 33 unforced errors, 7 out of 14 break points converted, saved all 3 break points, winning 19/30 at the net and serving at 62% are all very solid for a second round match. And for you stat junkies out there this was the 47th match Roger has played at Grand Slam level that finished in under 90 minutes, insane. As a fan you can't really ask for more here so early on in the tournament, as long as Roger improves round by round, which I think he did today ever so slightly these are good signs. And with the draw opening up more and more by the day this could be a very successful tournament as now both Berdych and Gublis have fallen at the hands of Gael Monfils. Monfils is really finding form right now and he could easily make the Quarters or the Semi's with the way he is playing, he's been out injured for ages but won a futures tournament and then made the final in Nice before the French started so he really is riding the crest of a wave. I happen to think Monfils is quite good to watch, he can be a complete clown on court and make some stupid shot choices that cost him dear but he actually has a big game and is a very good mover on clay. I mean it took Federer playing at his best to take him out the French Open in 2009, and they met in 2011 at Roland Garros too in the Quarters so he knows how to play here that's for sure. Next up is Benneteau, which I think means time for some revenge after the Rotterdam loss with a straight sets beatdown and that's what I fully expect to happen. I know when the draw came out everyone automatically got worried about Benneteau being in Roger's section but I think there's absolutely no way he's causing Federer any problems here. Benneteau is better on hard courts anyway but I just think Roger will school him here and take his game apart. I'm even more convinced now I know that Benneteau was struggling physically in his 5 set win over Kamke, I didn't see but apparently he hurt his leg, lost the 4th set 6-0 but came from a break down to win 6-4 in the fifth. Kamke actually won more points in the match so a big big choke from him and Benneteau did well to get out of that one. Usually tough matches gives players confidence but I figure Benneteau will be dreading Roger here, he's just spent a long time on court and isn't feeling great physically so he's bound to go into this one with a negative mindset. If you're going to beat Fed you definitely can't be starting the match without feeling good physically. French tennis players are fragile as it is, and Benneteau is no different so I think once Roger gets an early break the writing is on the wall with this one. So yeah, only way this one goes badly is if Benneteau played some inspired stuff and Fed is at his absolute worst. I think there's more chance of Wozniacki winning a slam than those two things happening so the smart money is on Fed here. I'll go for a 6-2 6-2 6-4 victory. It's on Friday and I'm guessing Roger will be back on Chatrier, which makes no difference to me really as he plays better on Lenglen as far as I'm concerned but centre court is just a happy a hunting ground. Allez! Roger played great today, a bit of UEs here and there but the rhythm and concentration was there overall, great match. Gulbis down, but Roger has to take care of the other boogeyman, Benneteau is injured I think, and Roger will be aware of the possible dangers, I believe he will do it in straights, ALLEZ! Pretty good to defend your first slam title! 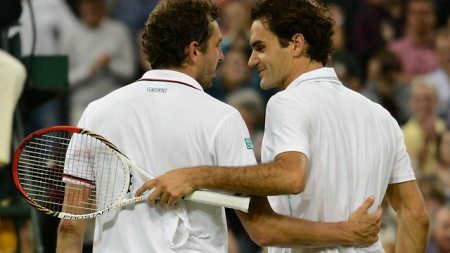 Benneteau not really a bogeyman for Fed. He just sucked against him twice, both indoors. He is the type of guy that can take advantage of way below par Fed. No chance on Friday, I am sure. Allez! No worries mate. Too bad you seem to have missed first by just as much. I kind of agree with you bout the errors Jonathan, but only to a certain extent: a lot of those errors (especially in first a second set) came of routine shots where he did not even try to attack. I love the attacking tennis, but a I think he should have a lot less errors. Not important against devarman, but later on it might cost him. I’d also like him to have a better %age behind his 1st serve, especialy against someone like somdev…. First serve percentage certainly needs to go up. Somdev got a brief peek at break points three different times. I’ve got nothing much to say about the match itself though. These new nearly-body-hugging shirts Nike has him wearing had the commentators go on such tangents as “Has he put on some weight? Must be all the Swiss chocolates tee hee” and express amazement at him perspiring “Do I see Roger sweating? Must have spilled some water. NO?!”. Why not just give him a classic polo? He’s not riding in the Tour de France you know. As long as winner outnumber unforced errors that is all that matter. It doesn’t matter if he has 300 errors as long as there are more winners. 62% on serve is ok, you can tell he was taking it easy on serve though, didn’t get over 200 KMH which he’d normally do. No reasons to be picky in this match. Drops 5 games, not broken. Devvarman was poor but you beat what is in front of you. Very solid match. To hit 54 winners in 22 games is amazing, especially because Somdev is a decent mover and gets a lot of balls back. The errors aren’t worrying because he went ultra-aggressive and that’s how he needs to play to beat a Tsonga or Djokovic. Yeah as long as the winner / unforced errors is + then he is in good shape. Devvarmann was hopeless! Fed was in first gear all the way. Benneteau needs to be respected but will be knackered after 2 x5 setters! Think Monfils will eventually run out of steam. Still looking at a Fed v Ferrer semi. Yeah Devvarman wasn’t great. I thought he would have some more weight of shot but he’s weak. P.S. Is it Devvarman with a W or two V’s? 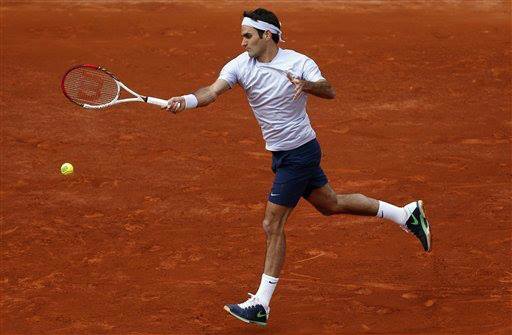 Who cares…Roger got the W! It wasn’t a yawn match man, there was some decent stuff from Fed, hitting clean, played some genius stuff. I ain’t enjoying the beat down of a No. 188. I want him to play like that vs Djokovic or Nadal. Sid, never ever call Roger’s matches ‘yawn’ !!! You cannot use that word in the same sentence as my hero. Trust me, you don’t want to read my angry side (Jonathan already went through that !!!). And Jonathan………………. hmm (yes, that is the best I can do !!!). I meant…the way Devvarman played was yawn, right? Oke Sid, nice save !!! You may continue !!! Devvarman is spelt with 2 V’s. How was that a Yawn match? Did you see some of Roger’s insane shots? The winner of the return of a smash? The insane IO FH setting up match point? The number of BH DTL today including the one on MP? It’s how he played 188 or top 10, that strategy will be effective. I think so, you can only beat what’s in front of you! Depends on whether they get thru…..
Fed only lost 7 points on his serve the whole match. That is amazing. Kyle, Devvarman is a nobody, he may become good in the future, but right now, he is “the” nobody among a bunch of nobodies 🙂 There is no reason to get carried away with this performance and also the next. Simon and Tsonga await. So does Ferrer. Calm down everyone! Yep, one match at a time! Benneteau will be pretty tired though I hope! Yeah I think Benneteau is getting schooled! Well he’s 28 so I doubt it. Nobody is getting carried away but tactically this was a sound match. Gotta employ these type of tactics early to find out what is working. He could have played this match without trying to be aggressive and won in straights but the fact he went for it is good. Been a while since I commented but I’ve been reading and enjoying your blog posts nonetheless. I just don’t always have much to add but today I will put my brief two cents in. First, I loved that Roger was so aggressive today even if it wasn’t much of a challenge. He got to experiment a bit and like you said, he’s gonna need those attacking shots more and more as he meets those other top guys. It was nice to relax and enjoy just watching him…without a lot of tension for a change. I agree he really doesn’t have to worry much about Benneteau but I guess we’ll find out and go from there. Second, I’ve held my tongue long enough so here goes…I hate the haircut. But not as much as I hate the outfit. The hair will grow back and let’s hope for no more unforced errors at the barber! But please, please go back to the polo! Ahh I like the hair cut, suits him. Playing some free flowing stuff. Outfit isn’t great though I agree, they even given Djokovic a polo. Did you click the link Alysha posted in the previous post for the USO outfit? Disaster! I went back to look and yep, disaster! Personally, it seems Roger might be a bit bored with his outfits. He’s made comments that he collaborates with Nike on styles, colors, etc., so he may be more involved with the changes than we think. Whatever it is, it’s NOT working for many of us, obviously! He seemed to be in control throughout, so much so that he looked to be toying with Somdev at times. The stats look great and I agree with you that as long as winners > UEs, the stats are good. He played an aggressive match, so it was only obvious that he missed some shots. Hope Benneteau won’t cause many problems, although I would like him to at least challenge Fed a bit, because Devvarman couldn’t do the task and I’d like Roger to be challenged a bit before the big matches (if he gets far enough). Yeah we gotta be happy with this. It was a good match to watch. I think Benneteau is going down here. Allez! Roger was fantastic. He has started grunting in a few forehands ! Also, on his second serve, he gives in that extra effort, if you have noticed. Yeah I liked his game. Hopefully keeps this form up. Allez!